Ah, the wonder and mystique of an enchanted kingdom. It brings back all the memories of the childhood days when we believed Santa Claus was real and we were actually visited by the Tooth Fairy. 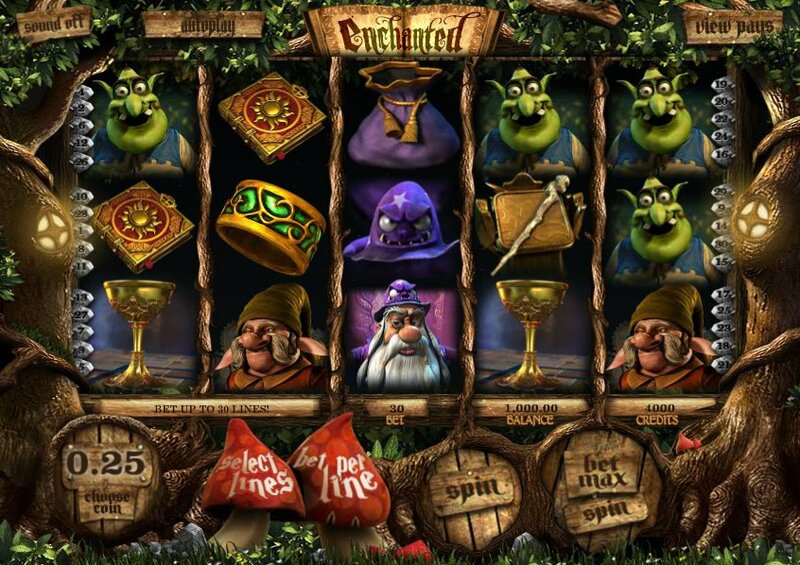 Online 3D slot developer Betsoft Gaming has released this fairytale-themed slot called Enchanted that appears to take the animations from the hit movie Shrek as its inspiration. It is a 5-reel, 30-payline slot with symbols including a Shrek-like goofy ogre called Rufus, the half asleep owl, Eldrid the wizard, Feera the fairy, a crazy hat that has a mad-looking face on it, a random dwarf-looking creature named Tonk, spell book, a gold bracelet, a gold goblet, a gold key and a crystal ball. Immediately, you are visually seduced by the slick graphics of this slot. The 3D images, the dynamic animations of the symbols when they complete a winning combinations and the fantastic characters and their expressions that are located on the reels. There are a number of exciting features to be triggered on this slot. The crazy hat helps to trigger the Crazy Hat’s Crazy Reels Bonus. This is triggered when you hit two or more crazy hats on the reels. If you manage to do this then three random reels will be chosen to re-spin giving you the chance to complete some extra winning combinations. The Ultimate Spell Book Free Spins Bonus is where you can earn some free spins. You must hit three or more of the spell book symbols across the reels to trigger the free spins. You will want to keep an eye out for the special Enchanted symbol during the free spins to boost your rewards. There is also a more interactive bonus feature that is triggered when you hit the Feera the fairy symbol and the Rufus the ogre symbol next to each other on an active pay-line. In this bonus, you will be taken to a second screen where you will need to help the Feera find her pet birdie that Rufus has stolen from her. Retrieve the birdie and you will win cash. You should also keep an eye out for the golden keys. Every time you hit one of these on the 5th reel then they will be collected. If you manage to collect three of them then you will be rewarded with a cash prize. 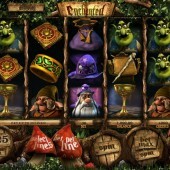 Enchanted is another slot that looks more beautiful than it is to play. There is no distinctive Wild or Scatter symbol as such but the inclusion of some decent bonus features saves it. If you are a fan of magical slots with a fairytale theme then you might want to check out the wondrous Enchanted Unicorn by slot developer IGT or there is also Sheriff Gaming’s delightful 3D slot Magical Forest.